You can always tell the locals from the tourists on BC ferries. The tourists are the ones glued to windows, binoculars and cameras, while the islanders have their noses buried in newspapers or a book, or are too busy gossiping with other islanders to notice the view. So, I finished an adult mystery on the way over to Pender Island, one of BC’s gorgeous, part forested, part sun-drenched rocky beaches west coast answers to paradise, and read Ingrid and the Wolf by Andre′ Alexis on the way home. Despite there being a few adult writers who write brilliant kids books, I’m sad to say that most do not. 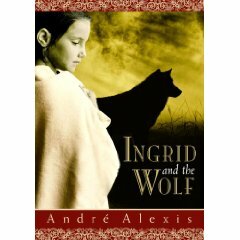 So you can understand my reluctance to crack the cover of Ingrid and the Wolf. Just another adult writer dashing off a quick kid’s book between ‘real books’ for a little income, I thought. I must admit though, I was pleasantly surprised. In fact, one of the reasons I decided to give it a chance was running across an article (can’t remember where―The Globe & Mail or maybe Quill & Quire) where he says that he read a draft to his kids who told him it was BORING, a humbling experience for any writer. Fortunately for us, Alexis took the criticism seriously. The story is about eleven year old Ingrid, who lives in Toronto with her immigrant parents. Ingrid’s life changes for the worse when a new girl comes into her school. Sheila uses typical bully tactics to isolate and victimize Ingrid, but Ingrid refuses the role of victim. It seems that she is not the first in her family to do so. It turns out that she is of royal Hungarian descent, something her parents tell her only after strange dreams of a wolf haunt her sleep. Her grandmother sends Ingrid a plane ticket to Hungary although Ingrid’s parents are reluctant to let her go. Finally, Ingrid’s determination wins out and she is sent to the old country to meet her grandmother. Instead of being welcomed into the bosom of family, Ingrid’s worthiness to carry the family title is challenged to a series of tests. Will Ingrid stand the tests set down by her ancestors? And what about the wolf who has plagued her dreams? These are questions that gnaw at Ingrid as well as the reader. The fact we know no more than the main character pulls us further into the story. Clearly Alexis listened to his children. Ingrid’s story is not the least bit boring. Alexis recall power as a story teller may lay in his ability to create a place and time and traditions that are hauntingly real. The wolf, the mansion, the tests that Ingrid must undergo―these do not seem in the least fictional. Unfortunately, the place where Alexis is weakest is in his ability to bring Ingrid back to a plausible present. While I wasn’t entirely convinced of the outcome relating to the wolf, I could at least suspend disbelief. Where I had trouble, was with Ingrid’s relationship with her best friend, who was two dimensional at best. But, these are small failings. I won’t wait so long before picking up a second Andre′ Alexis children’s book, should he choose to write another. I feel certain that his next will improve upon what has been a very strong beginning in the challenging world of children’s literature.